My main reference for Florida bridges is the 'Historic Highway Bridges of Florida' by the Florida DOT. 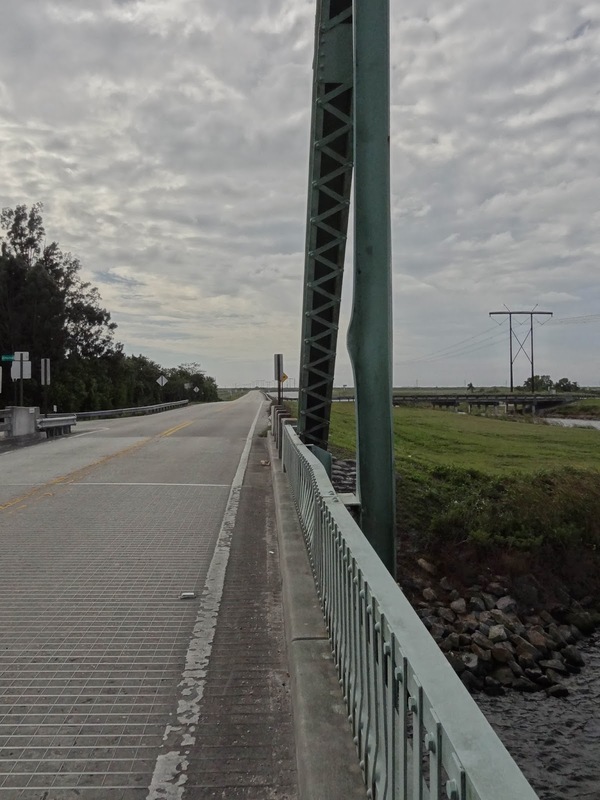 They said about today's bridge, "The Twenty Mile Bend Bridge, or Loxahatchee River Bridge features a 188 ft long Warren through truss mounted on a center-point pivot. The steel for this bridge carries the mill marks of 'Carnegie USA.'" The Twenty Mile Bend Bridge (FDOT#930940) is a swing bridge that was built in 1937. It's made up of laced and wide flange members, a couple of which were bent, probably from a vehicle collision. The laced members are connected with rivets and I noticed that some of the members were stamped with 'Tennessee' but I didn't notice 'Carnegie' on members. The bridge includes a steel girder approach span on the west side of the bridge. This site is where several canals come together and we can see an old concrete slab bridge on multicolumn bents in the distance in the photo above. Several different transmission lines also run through this bridge site. The bridge borders the Loxahatchee Wildlife Refuge. The Twenty Mile Bend Bridge is the second oldest bridge in Palm Beach County. The bridge is in good shape and got a sufficiency rating of 46 out of 100. I didn't see any sign that the bridge can still be swung. There didn't appear to be any boats in the canal and it looked like this is another bridge that would have to be moved by hand. Palm Beach County, Florida Bridges: Connors Highway (SR 700) Bridge across the Loxahatchee River by Mark Yashinsky is licensed under a Creative Commons Attribution-NonCommercial-NoDerivatives 4.0 International License.